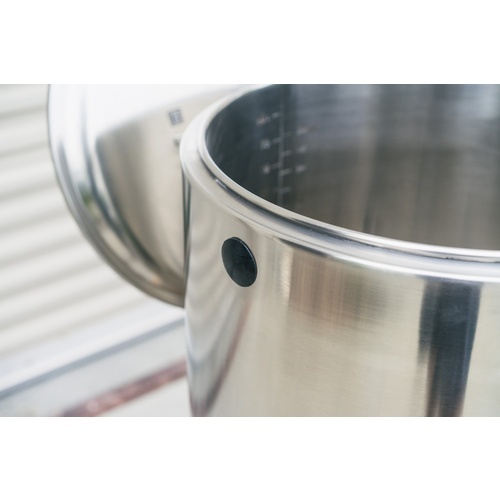 An insulated, stainless steel Mashtun for hombrewing that will keep your mash at the temperature you set. Retains an amazing amount of heat since it is double walled with a layer of insulation between the two stainless walls. 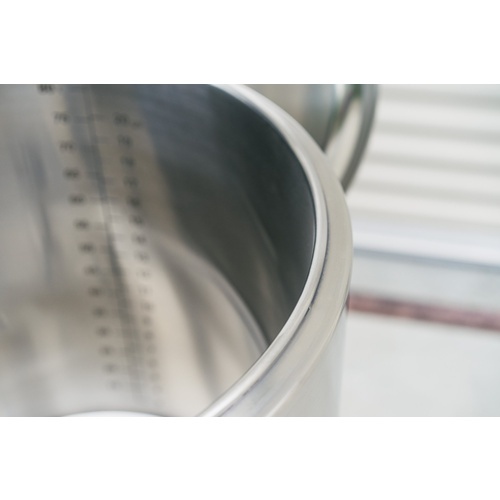 Unlike insulated plastic cooler the InfuSsion Mashtun is made of food safe stainless steel so you have no worries about the effect of heat on plastic. 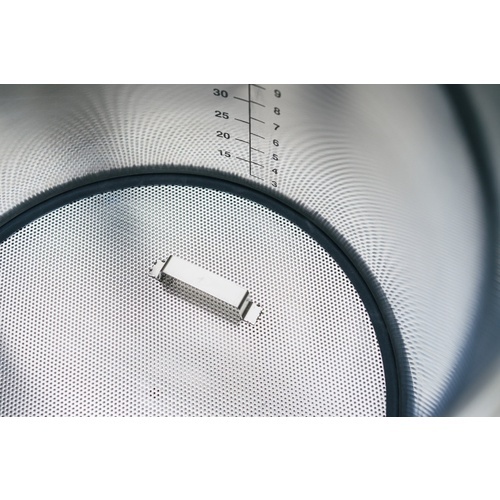 With cool features like an integrated center drain port, gasketed false bottom setup, etched volume markers, stainless hardware, and a digital thermometer, this is the ultimate mashtun! When Ss Brewtech tested against similar sized plastic cooler mash tuns, the Infussion dropped 5° F less over the course of a 60 minute mash. 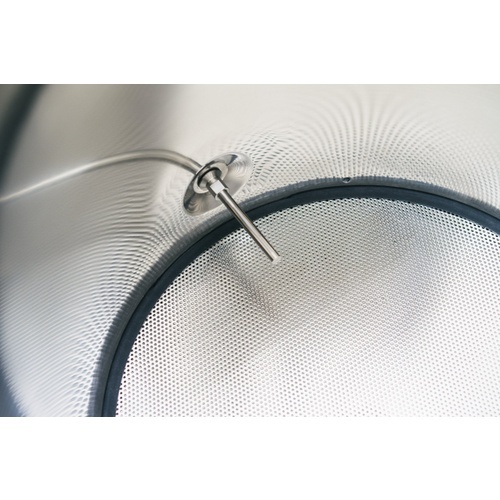 The center draining conical bottom vessel silicon gasketed false bottom minimizes the amount of water under the screen, what many brewers refer to as dead space, and allows for great efficiency. 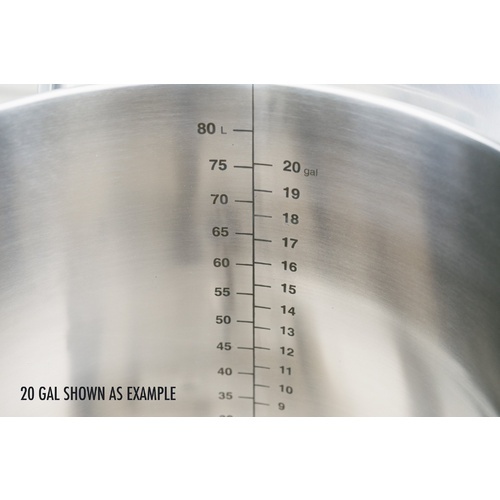 One of our favorite features is the simplest...the internal volume markers rid you forever of having to use a ruler to calculate the right amount of mash water. 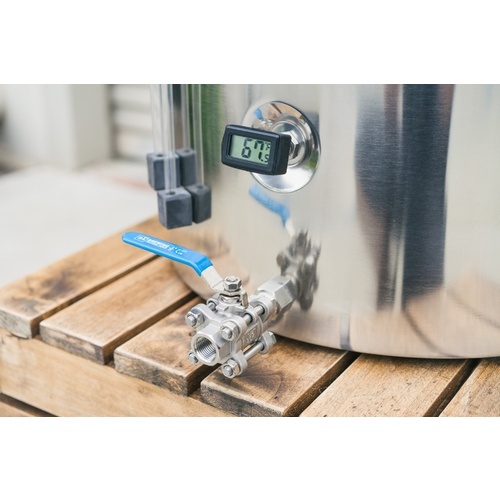 This is a great addition to any brewery, and with the additional upgrade kits in the pipeline like a Sparging System, Heating & Temp Control System the InfuSsion Mashtun will become of your favorite pieces of equipment for years to come! Tired of plastic coolers I replace every few years. Durable and quality stainless steel. Does this include a recirc hole predrilled? 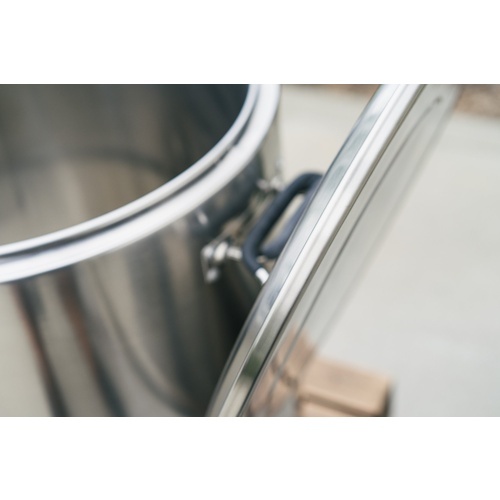 According to the Ss Brewtech website, that is only true for their 20 gallon mash tuns. Can someone please confirm? 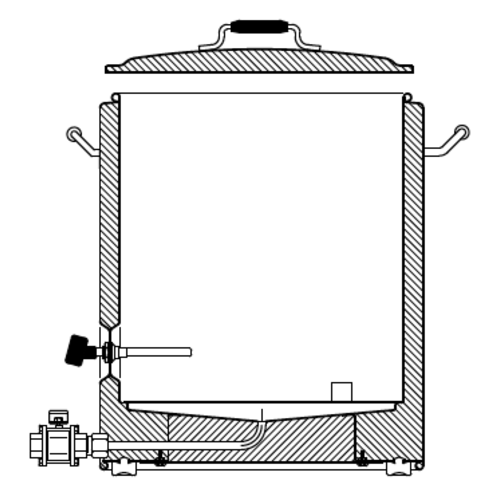 BEST ANSWER: Hi Lauren - Yes that is correct, the 20gal mash tun is the only tun with a recirc port pre-drilled. Overall I'm pretty happy with the infusion mash tun. You will have to adjust your strike water temperature though as this mash tun pulls a lot more heat away than regular cooler will. I use it with a HERMS setup and it works great. Rockin’ Fun with my mash tun! This is a great mash tun. It holds its temperature for a long time! Can’t wait to hook up a HERMS coil to my HLT and start step mashing with it. This has taken my brew room to a different level in brewing. The false bottom is THE best part of the engineering. It is secure and traps ALL of the grains away from the brew. This tun is a game changer. If you still mash with the old cooler you need some of this. This mash tun and kettle with recirc pump is a game changer. Great pic, thanks for the review. Superior quality in its construction and function. With a little care this mash tun should last for many years of brewing. Graduated from brew in a bag to this mashton. I thought Brew in a bag was fine but wanted improve my process. This is it! It held temp well. Thermometer was accurate. Easy to clean. And mine was already pre drilled and came with the recirc fitting. Added feature not mentioned on website. I purchased the 10 gallon version of this and as I put it together noticed something I wasn't expecting. It came with a pre drilled recirculation hole and included bulkhead. That's a nice feature that I thought was only on the 20 gal and up. Don't know if this is a fluke or just what they do with the newer models but I like It. It also comes with a plug that keeps it sealed in case you don't want to add the bulkhead. As I looked on SsBrewtech's site it still says this shouldn't be on the 10 gallon, but I'm not complaining. 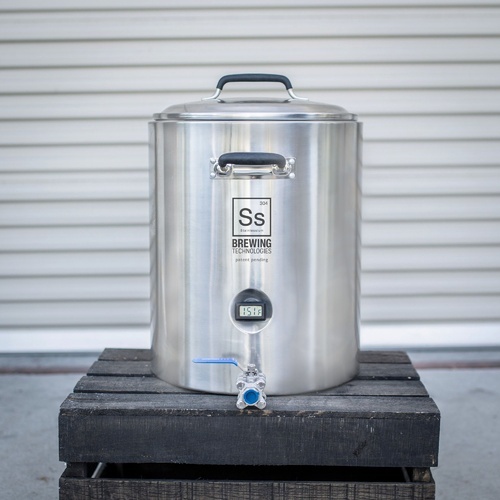 I've become a bit of a loyal customer of SS Brewtech products since I've been using their 7 gallon Chronical fermentor for some time and some of their other accessories. I bought the infusion despite its hefty price tag knowing that the mash tun would be a great looking and quality functioning product based on my experience with the chronical. Like one of the other reviewers said, this thing is built like a tank. Everything about it screams quality, from the dual walled insulated body to the form fitting false bottom. It's always a pleasure to pull this baby out on brew day because I know it won't disappoint. It holds temperature very well after its pre-heated and its super easy to clean. It's even cool when not in use because it looks so damn good sitting in my home bar. I am not a professional brewer but this thing sure makes you feel kind of like one. Highly recommended! Meh, for the money, not worth it in my opinion. Lovely in it's build quality, but that's about it. Depends what you are after. I've noticed the "precision thermometer" is WAY off--not just a calibration issue. Heat retention is good, but not justifiable for me over the cooler I came from: I need to decide if I'm keeping this thing or not. 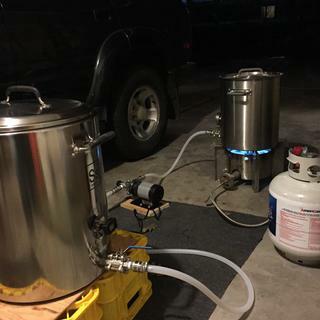 As per my last post I had not yet used my new mash tun. Well here I am today and I can tell you it exceeded all of my expectations. Hands down worked better than my igloo with the doomed false bottom. It used to be quite a choir to keep the flow going. with this new tun it was almost effortless. Plus it kept the temp with in range for at least 2 hours. More than enough time for my needs. 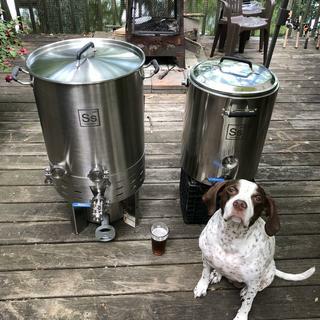 Received my mash tun today. I tell you the thing is built like a tank. Very solid. The false bottom with gasket fits like a glove, there is plenty of insulation between the walls to keep your mash at the right temp. There are thought a couple of things that I'm scratching my head over. The handles are on the front of the unit not on the sides making it a bit awkward. Plus the digital thermometer is a bit cheesy, there's no ON or OFF switch so unless you remove the batteries after each time you use it you can say goodbye to your batteries. For me these are all minor issues and I'm not going to let that detracted from what is otherwise a very nice tool. The handles make total sense - you pick it up from the side and don't have to deal with the thermometer and ball valve.